Two years ago Andrew and I were wed in a campground in Joshua Tree National Park in Southern California. We did not know what our future looked like, but it involved togetherness: on that front we were certain. A few months after we married I lost my job and we decided to travel across the US, exploring the great outdoors as we went. That trip was what started this blog, so I could share our experiences with friends and family (and for posterity, since I have a horrible memory). After our trip ended we decided to find fulfilling work outdoors, away from office cubicles and fluorescent lights. We landed on a farm in Snohomish, Washington, and after a (mostly!) successful season of farming I am happy to announce we have started our own business! Obviously this has been quite a remarkable two years. What started out as an exciting adventure has become more than a job, it is a way of life. I have developed into someone I might not have recognized just a few years back. Or rather I have nurtured those parts of myself that were submerged, struggling under the overwhelming influence of commercialism. I shopped too much, I bought expensive makeup, I flittered my money away on things in an attempt to fulfill myself. I know it’s a cheesy troupe, but indeed it seems true that you can’t buy happiness. If I extrapolate my experience onto our society at large, I sense a great emptiness that we are trying to fill with junk. I suspect the lack of interpersonal connections that comes from cubicle culture and digital communication share some of the blame. In this day, electronic gadgets are more highly valued than healthy foods, which of course I notice much more now that I am growing said food. According to the Bureau of Labor Statistics, in 1950 a whopping 29.7% of total expenditures was on food. In 2012 this number landed at 12.8%. Of course there are many complicated factors which go into a statistic like this, but I have no doubt that the availability of cheaply made, mass-manufactured “food” products and the prevalence of cheap, unethically raised meats, eggs, and dairy are a huge part of the equation. People now balk at spending considerable money on food, although to my mind what could be more important than that which nourishes you and keeps you healthy? If we spent more money on nutritious vegetables, I bet we’d spend less on those ubiquitous pills! In any case, where I once felt a need to acquire, I now put off going to the store and spending time and money when I could be/should be out weeding my beets. And maybe that’s really the crux of it after all: maybe when you’re farming (or otherwise working with your hands), you’re so busy and you get so tired from working hard that you just don’t have the time or energy for consumerism. It also doesn’t hurt that I have very little occasion to wear nice things. Either way, it’s a good thing because at this point I wouldn’t have the funds to support my old habits anyway! At the end of the day I feel more fulfilled than ever before, and I think a big part of it comes from living more in the moment, being outside in nature every day, and (honestly!) not having a television. Okay I realize most people check in here to read about life on the farm, not about my personal hippie revelations, so let’s get back to it! This spring we had NINE new baby goats come into this world. We had two sets of twins and a set of triplets all born within a few days of one another in early March. And then a month later…my little darling Gretchen kidded a set of twins too! Her twins are special: not only are they like my grandkids (heh!) they’re genetically unique. They are 75% Kiko and 25% Boer, and because of this they look different too. The little girl is all white with one brown spot near her ear, and her bigger brother is all brown with a little white patch on his forehead. They are extremely adorable and love to be scratched, just like their momma. Gretchen is a great mom too, which is a relief since this was her first time kidding. With spring came the rains, or rather, the rains stayed, and we had the wettest March on record with 6.65” of precipitation. This was about double the average, and boy did we feel it. The farm developed a few new “lakes” in some of the pastures, and our road was impassable for a couple of days. We were anxious to work the ground, but when nature has other plans, on the farm you must be patient. Now we’re well into April and the weather is doing the fun Washington spring thing, where one day it’s so sunny and warm you’re in a tank top and the next day there is a hailstorm. Thankfully we have had plenty of time to get things growing, and we’ve got quite a variety of plants in the ground and in the greenhouse. Which brings me to our new business! This year we have decided (with the help of Eric, the owner of Chinook Farms) to develop our own company: Bright Ide Acres! We are doing basically the same things as last season, but in a larger capacity and with more independence. Our CSA membership will be capped at around 40 boxes, and we will be attending a Sunday farmer’s market in Snohomish. We also expanded our animal operation significantly. Our animal counts for the season (not including goats) will be: 20 pigs, 600 broilers, and 100 turkeys! We still have a relatively small egg laying flock, which is unfortunate because demand is outpacing supply. In other words, things are going great for us and we’re actually expecting to make minimum wage this season. Hooray! 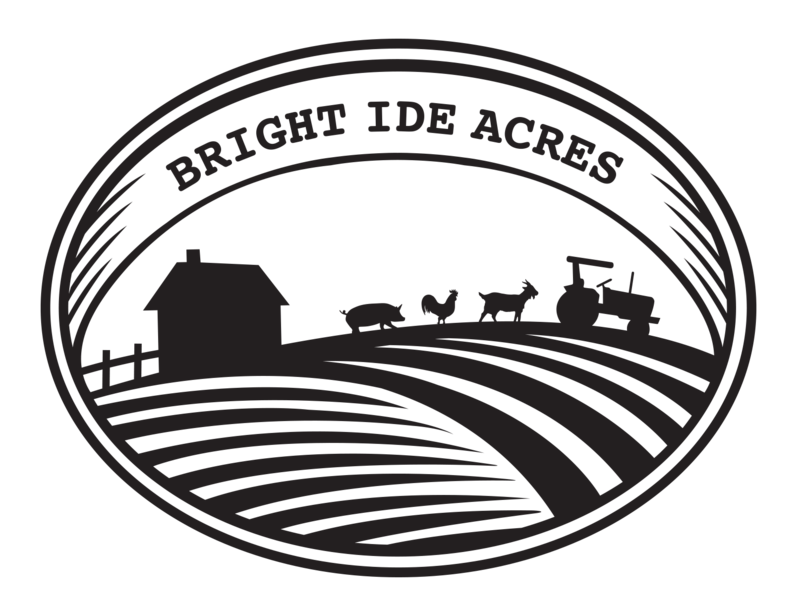 You can visit our farm website here: www.brightideacres.com. I have a mini farm blog there too, but if you want a good fix of farm photos you should like our page on facebook: www.facebook.com/brightideacres. I’m obsessive about taking and posting farm photos, especially this time of year when all the animals are young and adorable. That’s been our spring, in a nutshell. We are chugging away, getting things ready for the crazy, busy year ahead. Farming can be fairly stressful at times, and I often have anxiety about the upcoming season. But in those moments I take a deep breath, sniff a calming blend of essential oils I keep handy, and stick my nose back in those beets. When things get overwhelming, there is no better way to come back to the moment at hand than by sticking your fingers (and toes!) in the dirt for a while. Brooding chicks without electricity is a challenge. Andrew came up with a great propane system that is working really well. The “great flood” of 2014! This is our road into the farm. It only looked like this for a day though. Yay! Chicks love fresh greens too! They don’t like dandelions, which is a real shame. We have billions. This year we used an implement called a water wheel planter to get our brassicas in the ground. It’s a real time saver, but we still have to go back and fill in the holes. Grease the “feral barn cat” has turned out to be the cuddliest, most affectionate cat I’ve ever known. Sometimes he even wraps his paws around my face. We had the pleasure of dog sitting Oma for a week. She is bascially Zephyr’s girlfriend, and they have so much fun together. We went from 5 pigs to 20. Wish us luck!!! My two newest babies, with momma Gretchen walking up. Name ideas? Andrew’s grandparents came to visit in their RV for a week. We had a blast, and Garry worked really hard. Work hard, nap hard! The beavers have been busy this spring too! Our tomato forest in the greenhouse is looking good! I love this blog and will be sharing it with many people- and just for the record, your hippy thoughts are awesome. Wow, so many more animals! You must be super busy. Love you guys.